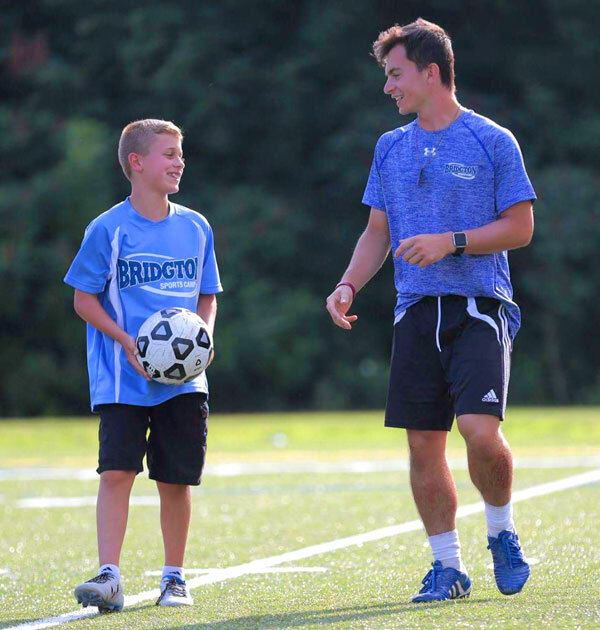 Soccer majors at Bridgton Sports Camp have every opportunity to develop and improve their skills in a fun and structured environment. Our soccer majors share the same passion for the sport and are eager to learn. 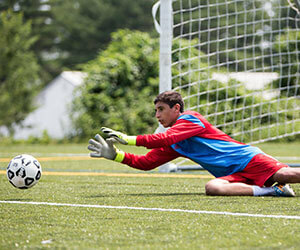 Emphasis is placed on the development of our campers’ core soccer skills (shooting, passing, heading), as well as advanced skill training such as formations, off the ball movement, dribbling moves, juggling and goalie techniques. Our program is based on a mix of instruction and drills followed by games, scrimmages, and challenges against other local camps. Overall, our job at BSC is to make sure that the boys leave camp as better, more efficient and confident soccer players while allowing them to enjoy the overall camp experience at the same time. Henry Ametti coaches at Hamden-Sydney College as their top assistant. H-SC is a highly competitive division III program in Virginia. Coach Ametti joined the Tigers following a four-year playing career under Coach DiNuzzo at University of Maine Farmington. He graduated from UMF in 2017 with a degree in General Studies and a minor in International Studies. In his second season as assistant coach at H-SC, Henry helps with all aspects of the team on a daily basis. In addition, Coach Ametti works with the u19 and u17 Richmond Strikers top club teams. He previously coached with the u17 and u9 Western Maine United club teams. In the past he has worked a variety of college soccer camps, including The U.S. Naval Academy, Bowdoin College, and Gettysburg College. Lastly, Ametti holds a USSF “D” License. At UMF, Henry was a four-year starter at outside back and center. He served as a captain his junior and senior year. He was also named to the NAC All-Tournament team in 2015 after leading UMF to the conference semifinals. 10 minutes – passing Drill: 3 man passing. One touch, two touch, Inside foot, Outside foot, Knee, Headers. Returning ball where it came from. 15 minutes – shooting drill: Around the cone (look at shooting drills). 10 minutes – 6 v 4: work on movement of the ball around the back, cutting and getting yourself open without the ball, Offense score goal, Defense get the ball out of bounds or gain possession of the ball. Shuffle defenders and offense in and out. 5 minutes – Plyometrics. Cones set up, shuffle, High knees, sprint, backwards. 3 sets a piece. 20 minutes – Offense, Defense: 8 v 6: Offense score goals, movement without the ball and lots of talk. Defense, stop goals and get the ball to the other side of the field, out of bounds, or gain possession. 15 minutes – Shooting Drill: Ball in the air. Start about 4 feet away, keep stepping back until you cannot hit the back of the net in the air. The last person is the winner. Go through about 3 times. 10 minutes – Passing: Player in the middle, one on each side. Pass to the player in the middle and return pass outside. Turn and receive then pass back to outside. How do you guys want to end the day??? We worked hard, we can play some world cup or we can scrimmage, or have a pk shootout, or something else that someone comes up with. 10 minutes – Conditioning: cone circle, go from inside cone to outside back, inside to outside and back. Continue until the end, finish when you have gone through 2 times. I’m happy to answer any questions you have about camp. Send me a message and I will get back to you as soon as possible.